David Weitzman and all of the Ka Gold Jewelry team would like to wish you very happy and joyful holidays with your loved ones!!! "A gift is a voluntary act which does not require anything in return". Giving to others is a basic act of love. All religions emphasis the act of "giving without expecting anything in return" as one of the noble acts. Not expecting anything in return means we enjoy the pleasure of giving and we focus on the receiver happiness. 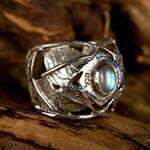 Many people buy David's creations as gifts for their loved ones. Each and every jewel is meant to remind the wearer of some understanding or a way of being that will inspire him. 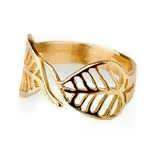 For example - the ring of love is meant to remind the wearer to be loving and open for others' love. 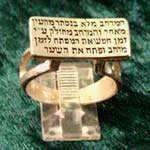 We give someone the ring of love because we believe that for them the possibility of being loving will be something that will inspire them. Something to which they will immediately be connected and will always cherish. 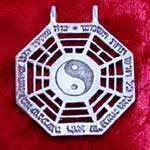 The I Ching is a tool to examine how a human being responds to the processes occurring in the universe. 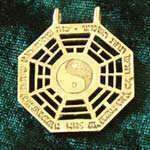 The I Ching gives us the ability to see data and reasons that are usually hidden from us. 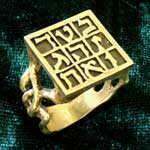 "I love therefore I am" ring is a paraphrase on the known philosopher Descartes' famous claim - "I think therefore I am". Descartes was trying to prove logically that he exists. The phrase is better known in Latin as - "Cogito ergo sum". 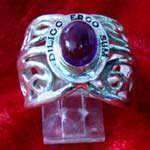 In this ring the phrase was changed from a logical claim to one that sums the essence of the entire creation - "I love therefore I am" or in Latin - "Diligo ergo sum". 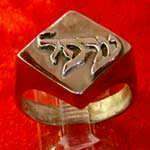 Buddhi ring is made in the shape of Ficus religiosa leaves, known as the tree under which the prince Siddhartha Gautama reached awakening and understanding of the source of all suffering. 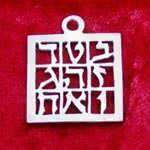 In the center of The MAGEN AVOT pendant is engraved the name of Abraham, surrounded by the names of the fathers and the mothers. 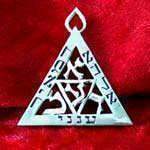 It is interesting to see that by taking the first letters of the names of the Fathers and the mothers - we receive the name Israel. A magic square is a square table in which all numbers columns, from all directions, have the same numerical value. 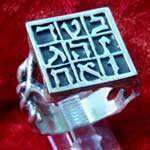 In Hebrew each letter has also a numerical value. 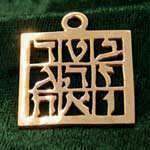 In the magic square pendant the numerical value of each column is 15 which is equivalent to the letters YOD, HE, used as one of the Hebrew names of G-D. 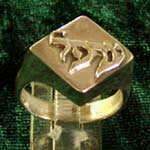 The ring is made in the shape of the Torii gate that appears at the entrances of Shinto shrines and other holy places in Japan. The gate symbolizes the entrance to the holy space where there are good spirits and forces of nature. 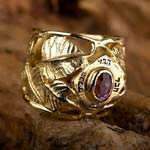 Reb Meir Ba'al Ha-Nes was one of the known Tannaim that lived in Israel in Roman times. 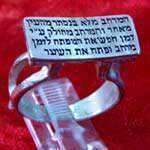 He was the pupil of Rabbi Akiva and is mentioned in many stories in the Gemara. 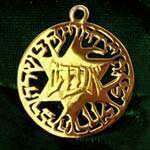 He is related with many miracles and that is the source for the name Ba'al Ha-Nes (miracle owner). Thousands of years after the hero's death in the book Dune, the hidden treasure of the drug that gives prophetic power was found. On the wall next to the drug was one word carved in Hebrew- ARAFEL (fog). This word expresses the deepest wish to be able not see everything and experience real joy and curiosity in life. 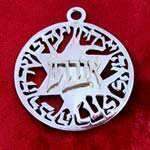 The Kabbalah (also known as kabala, cabala) means in Hebrew "reception" in the meaning of "received tradition" and indeed the term historically referred to all Judaism's oral law such as the words of the ancient prophets from the bible. Over time, many of the teachings were recorded and put available to all. The Hamsa (also known as Khamsa) is a hand shaped amulet used for protection by both Jewish and Muslim people. 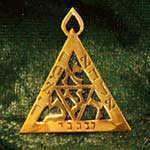 Its name comes from a Semitic root and literally means "five". The Hamsa is usually shaped in the form of a symmetrical hand, with thumbs on both side, and not in the anatomically correct way.